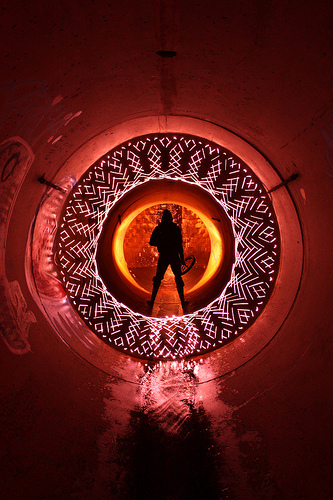 Light painting is the process of using one or more light sources to fill in a single exposure to create a unique image. 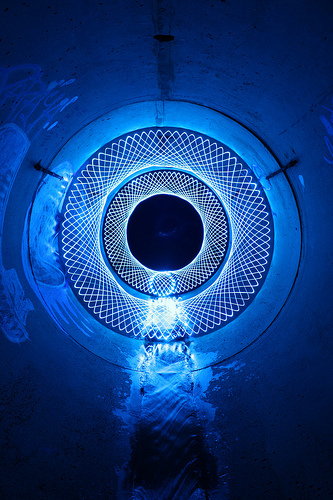 If you think of the light like a pencil to paper and then add tools like a Spirograph to the situation you might understand what exactly I am doing. 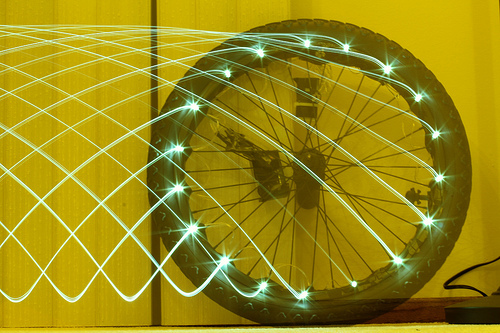 The light wheel is actually pretty simple and you can get pretty creative with it on the fly. 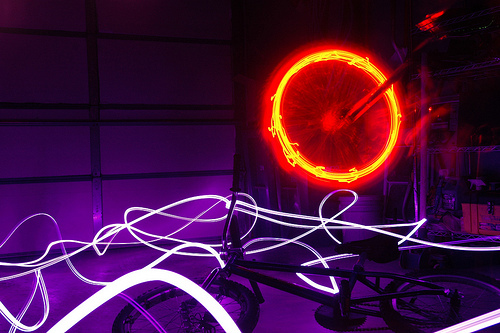 It is made up of a bicycle wheel (any size, however I have found that a 20” BMX bike wheel is a good size), A set of battery operated LED string lights. (These can be purchased from eBay or if you are lucky around October through March you can pick them up at Target or IKEA (any store that sells Christmas stuff is likely to have them). The lights are attached using black electrical tape and I used a bike peg I had laying around as the handle. 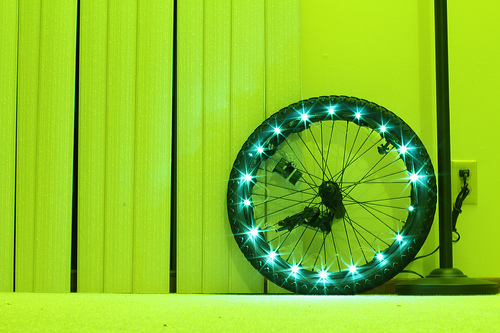 In this article, 55125 will teach you how to build your own light wheel. Bicycle Peg or other handle source. For this step we need to make sure that the newly acquired wheel is not reflective at all, we do not want any light bouncing off shiny metal surfaces or reflectors. 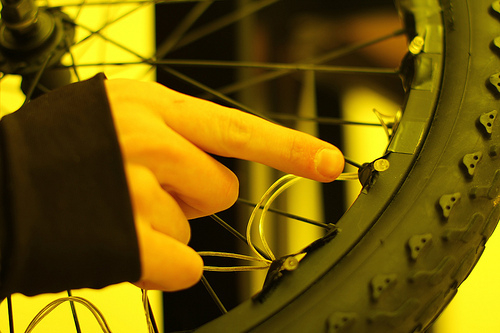 Start by removing any reflectors that are on the bike, usually a flat head screwdriver is all you need to pop them off. After you are finished with that you will need to paint the entire wheel flat black. Don’t be too perfect with this, it doesn’t need to look great, it just needs to work. I put down a sheet of cardboard I had laying around for over spray and just went to town with the can of spray paint. For this step you will need your scissors and tape and your string of battery powered lights. I hope you got creative and purchased some crazy colored / interesting lights. Start off with the battery back and switch, you want this as close to your hands as possible because you will have to find it in the dark, so the easier it is to find the switch, the better. Tape the switch and battery box to the rim on the side you will be holding the wheel on. This is up to you on where you put the switch, but like I stated before, the closer to your hands the better. 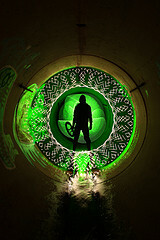 You will want to continue around the entire wheel until you get back to your starting point. You may find have extra lights, If that is the case tape off any extra lights and tape them to a spoke or somewhere out of the way. 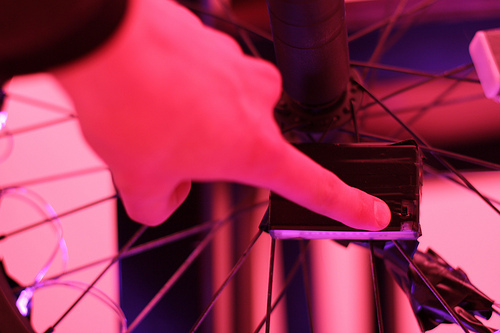 You now have your wheel completely fitted with lights and ready to go. The next step is to attach your handle for spinning the wheel. 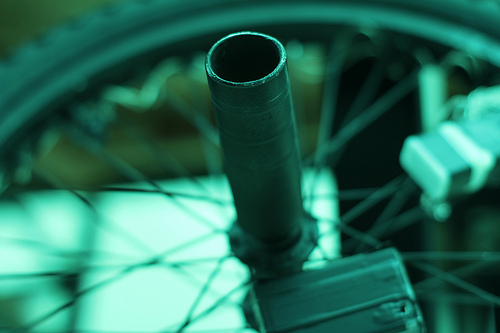 The easiest way to do this is to buy a set of pegs from pretty much any bike shop and just attach them to the wheel using a bolt that fits that specific rim. There are other options as well see TCB’s solution here where he used a paint roller handle and just screwed that directly to the wheel. 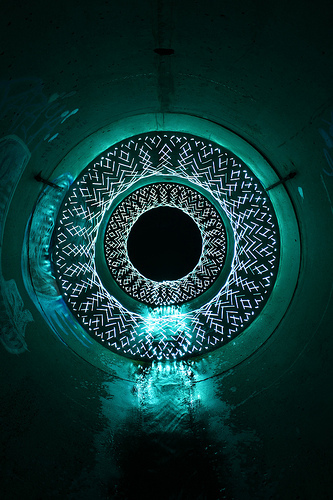 This has its advantages for larger tunnels where you need an extension to make really large Spirographs. Try turning on the lights and rolling it along the floor, this sounds dumb I know, but believe me, there is nothing worse than getting to an awesome spot and setting up everything only to find out that your tool is broken. Here Comes The Cool Part – What Do I Do With It? to illustrate how this all works, 55125 made a BTS video. Look for the Spirograph, the flash pop to freeze the photographer and the red stamp towards the end. Hope you enjoyed this tutorial and that it was helpful! That’s awesome, just wanted to applaud your effort!! !